* The Japan Brush is made with Black Goat Hair and a plain lacquered handle. * Japans are great for painting backgrounds, especially glass backgrounds. 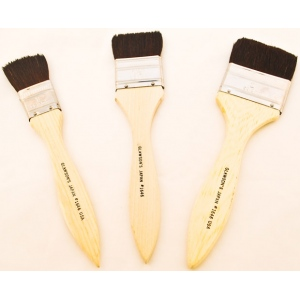 * They are great for pushing paint out of the way without leaving lines or streaks. * The Japan Brush is also used for sizing large letters and objects. * After you have gilded you can use the Japan Brush to brush off the 'tails'. * It will brush off without damaging the Gold Leaf. * You can brush vertical, horizontal or diagonal and the gold will show the direction of the brushing, without damaging the surface.